Windows not intended for residential applications are generally designed and installed differently from residential ones. Often they are site-built. This means they are custom designed and manufactured to order. Following shipment, they are assembled and installed at the building site. Seldom do they come in standard sizes, but there are exceptions. Nonresidential windows generally have a larger glass to frame area ratio. Though frame design is still important, the glazing generally dominates performance. Nonresidential windows generally have greater capacity for energy savings, due to the high daytime occupancies of the buildings on which they are installed, and the consequent displacement of daytime electric lighting costs. For this class of windows, therefore, the glazing system rules energy performance. Energy savings are realized through two mechanisms. First is daytime winter solar heat gain, which displaces space heating energy costs. Net savings accrue if these wintertime solar heat gains more than offset day and night conduction heat losses. Second is the admission of daylight illumination, as long as it is used to offset interior electric lighting energy use. Nonresidential buildings often have internal heat sources (from people, electric lights, equipment, and other sources) that more than offset the need for additional wintertime heating. Such buildings need cooling much if not all of the year, except perhaps in the coldest climate zones. In such cases. The solar heat gain is little or no advantage, or can be a serious liability. This liability is avoided by glazing treatments to reduce solar heat gain. This is discussed further in the section below. The keys to energy savings from daylighting are providing ways to make sure the electric lights are either turned off or dimmed during the daylight hours and assuring that the windows do not over-illuminate nor produce excessive solar heat gain or winter nighttime heat energy loss. Only then can the building capture the energy saving benefits of daylighting. For more information on the kinds of systems available for introducing daylight illumination into a building, and for guidance in the architectural design of daylit buildings, click on this link to our Solar Lighting web pages. Window glazing systems consist of from one to three or even four parallel sheets of glass separated by air (or insulating gas) spaces. They may contain internal shades of different kinds or attached interior shades or blinds for glare management and privacy. The glass employed in the single or multiple panes can be ordinary clear plate glass—or it can be glass with any of a variety of dyes and other imbedded chemicals to change its optical properties. The panes can have single- or multiple-layer coatings applied to them, also intended to alter the optical properties of the glass in beneficial ways. The outer pane can be impact-resistant, made of either plastic or a laminated glass composite of two thin sheets of glass separated by a clear, transparent binder, often polyvinyl butyrate. More detail on the coating and tinting options is provided at our web pages on Solar Gain and in our Industry Guide. Information concerning the economic consequences of various choices and design options can be found at our pages on window economics. Rooftop skylights are commonly used in nonresidential buildings, mainly for top floor areas displaced some distance from the window wall. They are often found in warehouses, in these cases often with relatively small aperture areas and relatively modest illumination levels. Skylights can provide copious illumination in areas too remote from windows in walls to receive adequate daylight. Under overcast skies, skylights can provide adequate illumination with little or no need for electric lighting. Under clear skies, managing direct beam sunlight from skylights can be a challenge. Direct sunlight is so bright that its unobstructed entry makes for very uneven room illumination and can produce serious glare and localized overheating. Avoiding the problems while taking advantage of the benefits is the essence of good skylight design, selection, and management. As with any lighting system design, it is important to match the source to the illuminated space and the needs of the occupants. In generally cool climates, and especially in those regions with skies more cloudy than clear, completely clear skylights with relatively large areas may be appropriate. However, glare and overheating can be serious problems, so direct sunbeam entry should be used judiciously wherever clear sky conditions are prominent. In areas boasting clear skies most of the time and especially in hot climates (and even in cold climates for buildings that are internal heat load dominated), skylight areas need to be modest in relation to room areas. Managing direct beam entry is essential to avoid glare. The direct sun entering an unshaded skylight can produce what might be called "killer glare" and localized overheating. For more information on glare, see our glare tutorial.The remainder of these remarks apply to cases where direct beam entry is to be avoided or at least well-managed. In such situations, there are many choices for avoiding the worst of the problems. These include incorporating diffusely transmitting materials to skylight glazing systems or wells, incorporating coatings on glazing surfaces, adding fixed or operable shades, or using tubular daylighting devices. If the dome is made diffusely transmitting—giving it a milky-white appearance—it will diffuse the direct beam sunlight striking it, sending the light down into the room below in many directions, producing a softer, more uniform illumination. Much of the light striking the diffuse dome will be diffusely reflected upwards. Thus, not quite as much light will enter the room as would be the case if the dome were perfectly clear. In this case, it might be best to use a slightly larger skylight area. Some prismatic skylight designs intending to transmit more of the light with good diffusion are becoming available. If the skylights you wish to use do not come with a diffusing option, you can instead place a flat or domed glazing across the bottom of the light well. In this case the skylight will look more like a fluorescent light fixture than a skylight, but there will be no mistaking it for a skylight as you see the shadow of the top edge of the light shaft creep across the diffuser as the sun moves through the sky during the middle of the day. If it is the solar heat gain you wish to avoid rather than the glare of direct beam entry, you can ask for a low solar gain low-e coating in the glazing system. 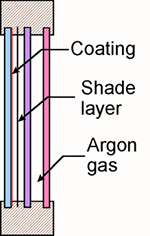 These coatings are described in the "How windows work" section of this web site, more particularly in the solar gain tutorial. The coating will transmit the sunlight essentially unimpeded, but will reflect the invisible infrared portion of the solar radiation incident on the skylight, thereby reducing the solar heat admitted by the skylight without much illumination reduction. The diffusing option described above has the important advantage of doing its job all the time, without need for any intervention by the occupant. It has the disadvantage of blocking the view up out of the skylight, an important feature of some skylight installations, especially those on steeply sloping roofs. In such situations, it may be better to install an operable shade on the skylight. This allows blocking the direct beam when it is objectionable while still opening the skylight for a clear view of the outdoors and for the admission of maximum daylight illumination at other times. Though it is generally best to block the sun's heat before it reaches the glazing using some form of exterior shade or shutter, with skylights such devices are generally considered unsightly or are not easily anchored to the building for sufficient protection from strong winds, so skylights generally have their shades on the inside. 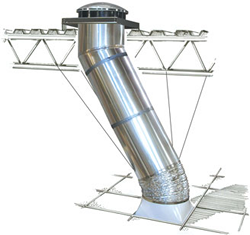 Tubular skylights are reflective cylinders or pipes placed between the roof and ceiling of a building. A clear plastic dome is sealed over the top of the cylinder to keep rain and dust out. Since the tube is so reflective that it would otherwise send bright, glare-producing sun rays into the room below, a flat or domed diffusing or lensed glazing is placed across the bottom of the light pipe, in the ceiling plane, much as shown schematically in the illustration. Energy costs and savings can be estimated with the help of a variety of performance calculation computer programs, which can also be used (interactively) in sizing the skylights intended for your application. Computer calculation software is mentioned in the next section. Tubular skylights are not currently included in energy simulation program options, but this feature may be added in the future. Horizontal illumination outdoors on a clear day can be about 60,000 to 80,000 lux, about 85% of which is from direct beam sunlight. A reasonable level of illumination in a room for reading tasks is around 600 to 800 lux (60 to 80 foot candles). If the light from your skylights were evenly distributed over the portion of the room to be illuminated by the skylights, and if we assume that the skylights transmit all of the illumination incident on them, then the total skylight area would need to be about 1% of the illuminated area (600 is 1% of 60,000). If the skylights transmit only 50% of the clear sky daylight incident on them, then you would need to double the skylight area to compensate. For those times (morning, afternoon, and under overcast skies) when the outside illumination is less than 60,000 lux, the skylight areas should be somewhat larger, say 4 to 6 percent of the area of the room to be illuminated. For still higher illumination levels, the skylight area can be increased further. Going too far with this, however, can introduce excessive solar heat gain. The system luminous efficacy of skylights is much higher than that of incandescent electric lighting of equivalent illumination, so the energy penalty is modest for slight over sizing of skylights. Even hightly-efficient fluorescent lighting systems use considerable electricity compared with daylighting systems properly sized and managed, so skylights can be an effective means for providing good quality illumination, promoting high worker comfort and productivity, at modest energy costs. One reason for this is that electrical energy is needed both to power electric lighting and to remove the heat generated by these lights, while skylights need electrical energy only to remove the sun's heat, which is generally less than that produced by electric lighting at approximately the same illumination levels. 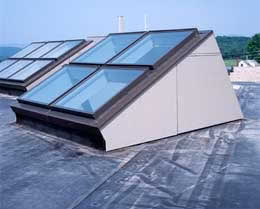 For more information on the energy consequences of skylights and for further assistance in computing the appropriate aperture areas for your application, visit the web site of the Efficient Windows Collaborative, and click on the Windows Selection tool, specify skylights, and choose a city near you. Lawrence Berkeley Laboratory's RESFEN computer program recently added an approximate skylight energy calculation option. The program is under development and its handling of skylights should be improved in the future. You can also download SkyVision, a skylight sizing and energy computer program, from the National Research Council of Canada. For a description and download instructions, click here: SkyVision description.